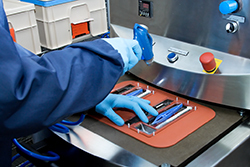 Nelipak produces all sealing tools in-house. Nelipak can design and build sealing dies for a range of non Nelipak machines matched to trays supplied by Nelipak or third party suppliers. The vast experience we have gained over the years has perfected our skills and methods. This results in sealing tools which are best in class in providing you with perfect seals over and over again. We guarantee that by using our blisters, machines and sealing tools in combination with recommended lids, you will be able to run an optimized packaging operation capable of achieving solid, validated seals, seal after seal.